I haven't done an update on Norah recently, so here we go! I can't believe she's just about 3.5. It seems like we just celebrated her third birthday. It also seems like we just celebrated her second and first birthdays, and the day she was born! These three years have been so great. Being a mom is the most amazing gift. 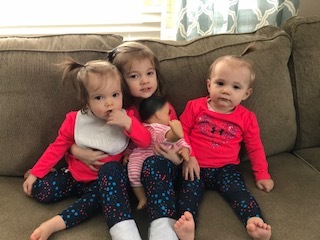 It's never ending work, but I wouldn't want to change it and I am so grateful to be home with my girls. Norah is growing up into a very special young lady. She seems older and older all the time. She's smart as a whip, nothing gets past her, and she has the memory of an encyclopedia it seems. She knows where we are going in the car and asks why we are taking a different route when we aren't driving the usual way to a familiar place. I never consciously taught her this, so she obviously picked it up hearing me leave messages to people, but she knows my entire phone number, even area code. She can identify some letters, their sounds, and words that start with a specific letter. She's not super consistent at it, but will just randomly throw bits out there that she's retaining, like the other day when she said, "Sister starts with S. So does snake." She frequently asks what random words start with. She knows all of her colors and shapes. Norah's favorite things to do right now are play with her dolls and color pictures. She does those two things every single day. 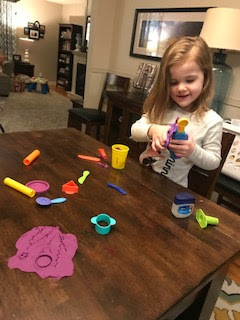 Norah is really good at coloring, and is even showing beginning writing skills like holding a pencil correctly and making individual marks for different letters. She also loves to cut with her "kid scissors." She had been asking for a pair for awhile, and was so happy to get a pair. She likes to cut magazine pages into tiny confetti pieces, and also glue pieces together. Overall, Norah is a wonderful helper and big sister. Of course, she has a few moments here and there, especially when Lucy and Ellory are getting into her stuff or trying to get into her room when she's in the middle of a project or play scene in there, but watching her with Lucy and Ellory is so precious. 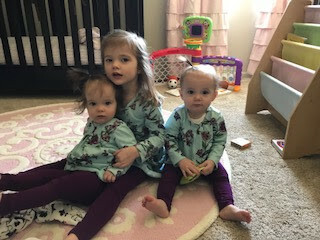 It makes me think back to when I was pregnant and so nervous about how having twins would be hard for her, but He has been so faithful to us this last year during the crazy moments. 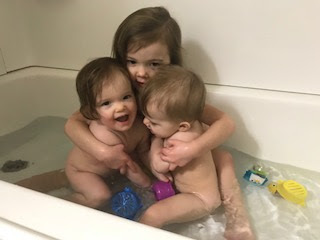 Someone told me when I was pregnant to think about all the benefits that having siblings would bring to Norah, and that's been a joy to witness. 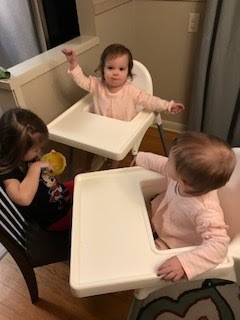 Norah can get Lucy and Ellory to laugh like no one else. 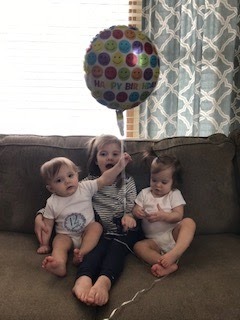 Lucy and Ellory love to watch whatever Norah is doing and you can tell they adore her and look up to her already. Sometimes Norah seems wise beyond her years. Her insights into things are so detailed and thoughtful. 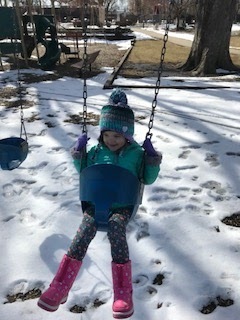 She throws far fewer tantrums than when she was two, but even though they are rarer these days, they are intense when they happen. She can be stubborn occasionally and a little issue turns into a long ordeal, and we've had more conversations than I would like lately about whining. Most of the time, though, she is sweet as sugar and generally lovely to be around. 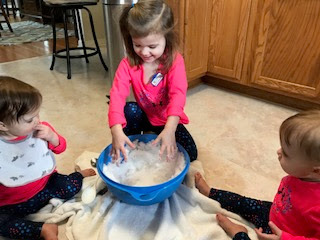 Norah is going to start three-year-old preschool in the fall, and I think that will be really good for her. It will be sad to see her leave the nest, even though it's only two short mornings a week, but she's excited for it and the social aspect will be good for her, and something I can't replicate at home. 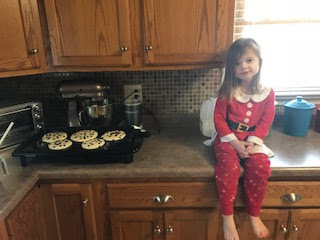 (Like I can teach her all the academics at home, but I think it will be good for her to experience listening to teachers and being in a group setting.) She very quickly chose a dark blue (her favorite color) backpack with colored hearts on it. 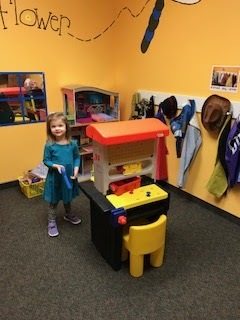 Since she turned three, she has also been going to Sunday School at church, and it's gone very well! I was sure she would have a hard time adjusting, but she's done great. She was a little hesitant the first day, but didn't cry, and she's loved it ever since! It's been a good buffer for her to practice being away from us before preschool starts. Norah says a lot of funny things too. The other day I was on the phone asking a question about a bill. She asked what I was doing, and I said the bill was for her (from the dentist), and I jokingly asked if she had money to pay for it. She, very seriously, commented, "Mom, I don't even have a wallet." She thought it was hilarious when she had a "bubble toot" in the bathtub. 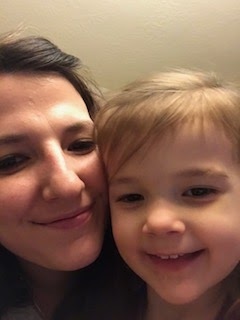 We have practiced the phrase, "Okay mommy, I will listen," when she's having trouble listening, and she's so proud of herself when she says that the first time and does well. She's also said, "I like myself when I listen" several times. She says, "That makes God happy when I _____" about different things sometimes too. Her favorite song right now is How He Loves. She loves to dance to Can't Stop the Feeling by Justin Timberlake. We went to a wedding over Christmas and it was the first wedding dance she actually remembers, and she loved the Cupid Shuffle song for awhile afterwards. We went to the indoor pool to celebrate Lucy and Ellory's first birthday, and Norah had been asking to go several times for a few weeks, and it was completely worth all the work to see how excited Norah was when we got there- just beaming and jumping up and down waiting in line to pay. Doing fun, special things with your kids is the best! Before we went, she sweetly asked me if it would be alright if I stayed back with Lucy and Ellory to she could go swim with Daddy, like she didn't want to hurt my feelings. She also asks lots of clarifying questions, like what the difference is between a beard and a mustache. She's whined that, "sharing is hard" sometimes when she doesn't want to. 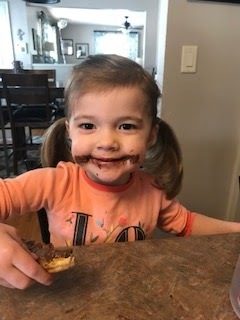 Norah's favorite treat is an oreo. She loves her milk. (We've been trying to limit it more before bed, because she's doing excellent in the bathroom area, but still wakes up often in the night, crying for help to go potty. She sometimes still asks for help during the day, but is definitely able to go by herself and hasn't had any accidents in a very long time.) She loves mac and cheese, and basically anything with noodles. She loves cheese and "black granola bars," which are these chocolate covered granola bars. I'm sure they're not the healthiest, but oh well since she doesn't eat them that often. She also loves chips and would eat way too many if we'd let her. She is very particular about what she sleeps in- she only wears a certain kind of pajamas, and if her shirt doesn't feel right (like if it has a tag, collar, or is made of a different material like fleece or something), she will ask to change into a t-shirt for nap. She occasionally takes awhile to fall asleep or wakes up early, but still takes a solid nap everyday, which we are thankful for! If we don't have to go anywhere, Norah loves to wear pajamas all day. 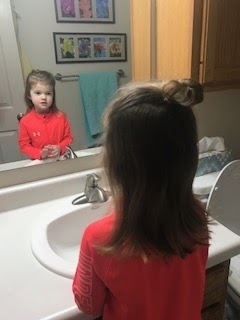 Her favorite hairstyle is a mini ponytail with a braid. She likes to watch Daniel Tiger. 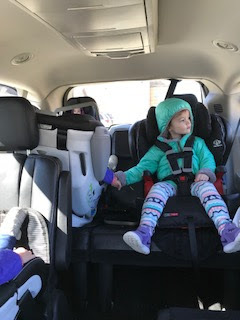 She was excited to get her new big girl car seat (she got a new booster type car seat when Lucy and Ellory got their convertible seats). She learned this from Amma (Kley's mom), when she took a bath at their house, but she loves to make potions, which is basically like mixing stuff together and shaking it and pouring it into different cups/bottles (usually it's just soap and water to mix bubbles!). Norah, there are so many good things we could say about you. You are a light. We are so glad you are our daughter. You are so very loved. 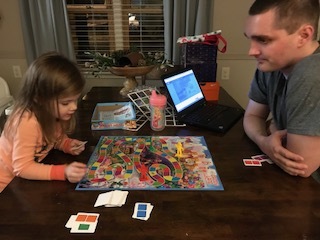 Playing Candyland with Daddy (one of her Christmas presents). 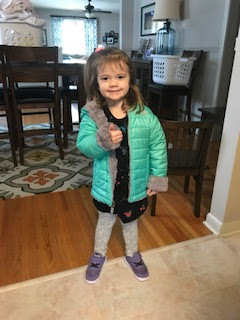 "Look mom, I put my shoes and coat on all by myself!" 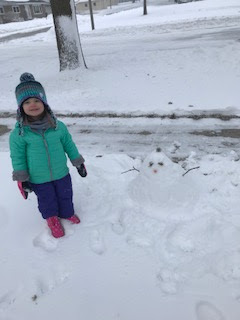 Our tiny blob of a snowman, but she was pleased with it! Helping feed Lucy and Ellory all by herself. 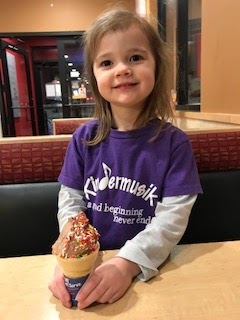 Mommy-daughter date for sprinkle ice cream cones after her Kindermusik class. 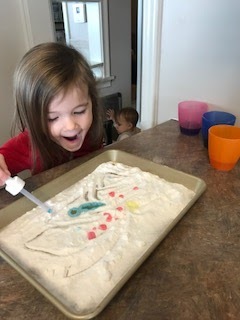 The "amazing science experiment" with colored vinegar and baking soda. Lucy and Ellory are one! 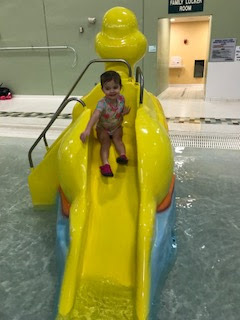 Norah loved this new little slide when we made it to the indoor pool! 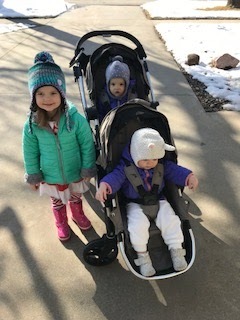 One of our first walks when it got above freezing. 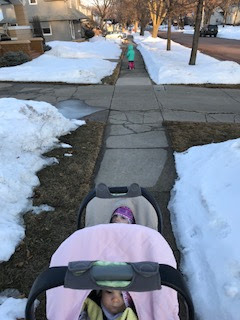 It's hard to tell, but Norah insisted on pushing her lawn mower. Ha. 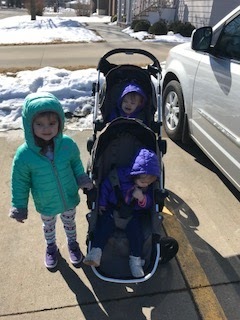 Big girl stroller seats- so special to watch Norah be excited for them about the little things. First ride in the van with all of their new seats and Norah was holding Lucy's hand! Saturday morning chocolate chip pancakes. First time back at the park for the year. Norah requested a "mini bun with some down" so she could look like Princess Belle. This was so fun to read!! We love you Norah!! !